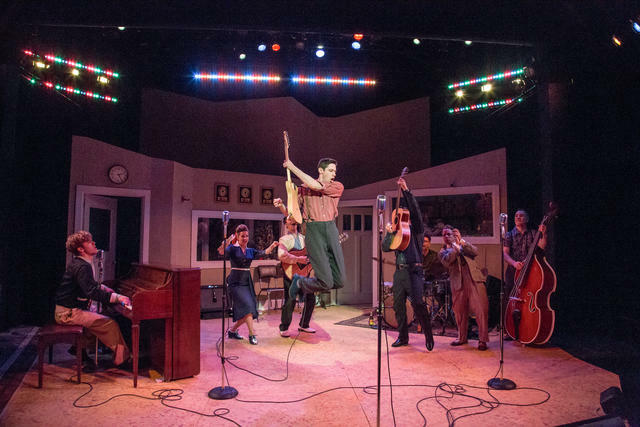 A swashbuckling, powerhouse production awaits lovers of rock and roll at Berkshire Theatre Group’s Million Dollar Quartet. 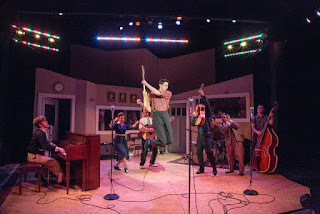 Written by Colin Escott and Floyd Mutrux, based on Mutrux’s original concept, Million Dollar Quartet is inspired by a true 1956 meeting of some almost mythic talents: Johnny Cash, Jerry Lee Lewis, Carl Perkins and Elvis Presley. They come together at the recording studio of Sam Phillips, the insightful manager who first discovered them; each one with plans for furthering his career in the music business. The drama of this juke box musical centers around whether Sam will become part of their futures, or left behind in their past. Director/Musical Director James Barry’s inspired direction provides a completely unique experience in each musical number, showcasing the gifts of each performer onstage. He uses the different playing areas (such as a tiny recording booth, an alley, and even a hallway) as skillfully as his cast does their instruments, making it possible to enjoy this show as much for its staging as for its music. Highlights of the production: the deep bass voice of Johnny Cash (Bill Sheets); sensuous moves and showmanship by Elvis Presley (Brycen Katolinsky); sensational guitar playing by Carl Perkins (Colin Summers); and the piano bravado and brilliance of Jerry Lee Lewis (Gabriel Aronson.) These performers light up the stage singly and as an ensemble, and are a treat to behold. Equally remarkable are Brother Jay (Nathan Yates Douglass) on bass and Fluke (David W. Lincoln) on drums. Their musical skills shine as strong and bright as the boys of the quartet - and that’s saying a great deal. Kudos as well to Dyanne (Christy Coco), who rocks the stage with her “Fever” and “I Hear You Knockin’” solos. She holds her own in this production filled with outstanding musical talent. The pivotal role of manager Sam Phillips is played by Ben Nordstrom with bold charm and conviction. He narrates this memory musical, smoothly drawing the audience back and forth in time with him. Nordstrom has sure theatrical savvy and impeccable timing, truly the leader of this pack. Scenic and Costume Designer Jessica Ford’s period costumes and sets are stunning. Her attention to detail (down to each character’s shoes) makes this production a feast for the eyes. The historic projections designed by Nicholas Hussong glow softly in the background during many scenes, bringing a bygone era back to life. Much praise also to Lighting Designer Oliver Wason for subtle changes in color to express the mood of each different song, and to Sound Designer Nathan Leigh for holding the sounds and music together without any one instrument or vocal overwhelming the other. Bravo!